Knational cargo sales and marketing initiatives as well roles of increasing responsibility for shipping lines owned by as tracking trends and issues related to maximizing the port’s A.P. Moller – Maersk. DeMarco holds a Bachelor of Science business potential. DeMarco has nearly two decades of busi- degree in Business Administration from Kennesaw State Uni- ness development experience in the logistics industry, with a versity. 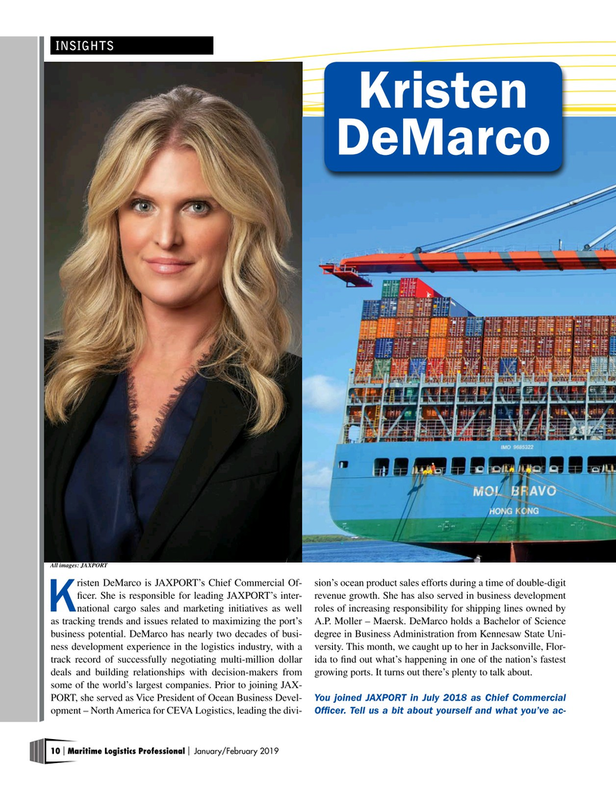 This month, we caught up to her in Jacksonville, Flor- track record of successfully negotiating multi-million dollar ida to fnd out what’s happening in one of the nation’s fastest deals and building relationships with decision-makers from growing ports. It turns out there’s plenty to talk about.